Insulation best practices for keeping fire sprinklers operational during cold snaps. With much of the country currently in the grips of a record-breaking cold snap, homeowners may be supplementing their heat sources with portable heating options that increase the risk of fire. Home sprinkler systems are a key defense against fire spread, but they won’t work if sprinkler system pipes are frozen and water damage from pipes may be just as costly as a house fire. 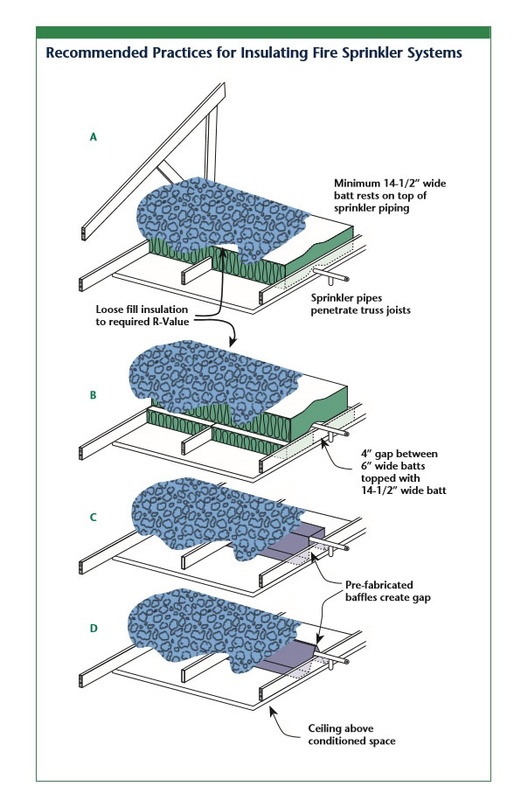 One of the primary ways to reduce the risk of sprinkler system freezing is to properly install mineral fiber insulation. Although insulation alone may not prevent freezing when temperatures are cold enough for an extended period, properly installed insulation can significantly reduce the chance of sprinkler systems freezing. A basic knowledge of heat flow will make clear how insulation is used to reduce the chance of sprinkler pipes freezing. Related Story: Tough Fire Code Demands Insulation Innovation. Insulation with high R-value between the pipe and the exterior or unconditioned space. Materials with very low R-value (g. gypsum board) or preferably nothing between the pipe and the heated area. A reliable heating system to replace the heat leaving the building. These recommended practices are designed to offer options that could reduce the chance of sprinkler systems freezing. For more guidance on the installation of sprinkler systems, refer to the National Fire Protection Association Standard 13D. Related Story: NFPA Launches Policy Institute to Support Fire and Life Safety Efforts.